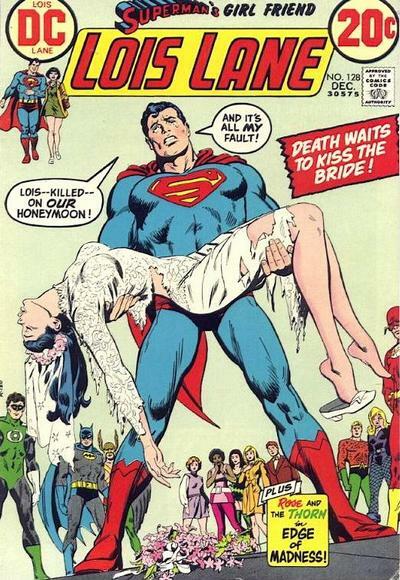 I’m a fan of Pieta-inspired comic book covers, but this issue of Lois Lane is one I hadn’t seen until recently. Whatever twisted meaning you might wish to interpret is your own business, but Bob Oksner’s cover is one of my favorites of this theme. This is a photo of Michelangelo’s Pieta. I had the chance to see it at St. Peter’s Basilica in 2011, and much like David in Florence or Venus De Milo in Paris, the sculpture is almost overwhelming in person. 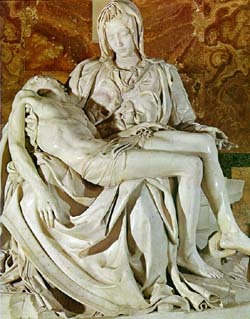 The Pieta depicts Mary cradling the slain body of her son (“Someone Christ, King of the Jews”). However, it’s not surprising that the male-dominated comic book industry tends to focus on men holding limp female bodies (and occasionally a limp male body).